In a recent Famitsu article on Final Fantasy VII: Advent Children Complete, Square Enix designer Tetsuya Nomura talks FFVII: ACC. We know about that, tell us about those unreleased Final Fantasy games! Nomura told Famitsu that the voice recording for FFXIII is in its final stages. Versus-wise, Nomura says that the game's costume designer has finished up the character outfits for the main character and his comrades. The costumes are apparently hard to recreate in-game due to their material. They also accidently made a pair of shoes that don't match. DOH. 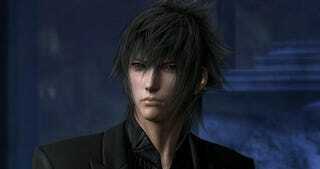 Rest easy — whenever Square Enix finally releases FF Versus XIII, the characters will be well dressed. Phew.